(L) Local FEMA representative Scott Wells responds to questions. (R) Congresswoman Maxine Waters (D-Calif.) questions FEMA officer. NEW ORLEANS (Finalcall.com) - The residents of New Orleans displaced by Hurricane Katrina and still disconnected due to tremendous failures by the federal government do not need any further evidence of the ineptness of the system to provide relief and restoration provisions to them. 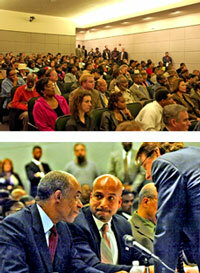 (Top) The audience was very vocal in their responses to the testimony in the field hearing. (Bottom) Congressman William Jefferson (D-La.) and New Orleans Mayor Ray Nagin. For the rest of the world, the congressional field hearing of the Subcommittee on Housing and Community Development held here Jan. 13 revealed ample proof that the people should not rely or wait on a government system that is riddled with racism, stagnated by a bureaucracy that cannot think or move outside of the box and is bereft of the will to take right and reasonable courses of action to ease the suffering of people. Chaired by Congressman Bob Ney (R-Ohio), this subcommittee of the House of Representatives Committee on Financial Services has listened to approximately 58 witnesses in the three previous hearings and one roundtable held in the past four months. The Jan. 13 hearing, “Housing Options in the Aftermath of Hurricanes Katrina and Rita,” the first held in the city, lasted for nearly four hours in the administration building of the Port of New Orleans, during which a panel of congressional representatives hurled questions at two panels of witnesses that consisted of city officials, representatives of government agencies, community-based agencies, community leaders and residents. A fifth hearing was held in Gulfport, Miss., the following day. The six members of the subcommittee who were present, headed by Ranking Member Congresswoman Maxine Waters (D-Calif.), were also members of the Congressional Black Caucus (CBC). 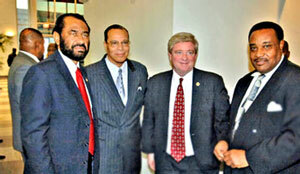 Two visiting congressional representatives from Mississippi and Louisiana joined them. The first panel of witnesses to sit before the subcommittee consisted of New Orleans Mayor Ray Nagin, Louisiana Congressman William Jefferson, local FEMA (Federal Emergency Management Agency) representative Scott Wells and Charles Williams of the Department of Housing and Urban Development (HUD). After brief opening statements from each congressional member, the panel witnesses presented brief testimonies. Open questioning followed, punctuated with lively discussion and dominated by fierce exchanges between Rep. Waters and Mr. Wells from FEMA. Clear questions received cloudy contradictory responses, causing tension to bristle from the congressional panel to the witness panel, and all the way through the audience of nearly 300 people that packed the board room. As disgruntled and offended murmurs from the audience grew louder, and even erupted into a shout of “Evict FEMA!” and applause swelled for CBC members, Rep. Ney gave several reminders of decorum protocols of silence for the “listening” audience. But this should have been anticipated with the firmness of the opening statements. Members of the Subcommittee on Housing and Community Opportunity. She also maintained that they do not intend on letting the people lose their land through eminent domain laws, as well as noted the need to integrate the homeless population into recovery efforts. “Our legislative efforts must be about helping to rebuild and restore communities, but in equitable strategies,” she said. Rep. Al Green (D-Texas) pointed out that businesses will be reluctant to return to the city if the government does not secure the levee system to withstand a Category 5 hurricane. He also argued for the right of the displaced citizens to exercise their vote in local elections regardless of the city to which they were evacuated. “People who live in the United States who are from Mexico are going to elect representatives in Mexico. There is no reason why we should allow politics to prevent the people who are born and reared as residents in this city from electing their representatives. If they don’t get the opportunity to do that, we may get a different look when it comes to representing New Orleans,” he charged. “I am convinced that New Orleans will come back. The question that I grapple with is, ‘who will come back?’ I am committed to having the least, the last and the lost return and having this city as their home,” he concluded. Rep. Gene Taylor (D-Miss.) reminded everyone that the flood hit Louisiana, but the hurricane hit Mississippi. He decried the efforts of FEMA, noting that the 5,000 families are still waiting on trailers, although 30,000 have been installed thus far, and that the trailers are for weekend use, even though the people are scheduled to live in them for 18 months. He also pointed out that the propane tanks used to generate energy is a major obstacle for senior citizens to crank up regularly, so the trailers should be upgraded to be fitted for electricity. Congressman Jefferson dismissed all notions that all areas of New Orleans could not be built better than ever, even though 50 percent of all housing was affected by floodwaters. He based his presentation on his observations during a recent trip to the Netherlands to study their city infrastructure. He explained that the Netherlands is 20 feet below sea level, yet 70 percent of the revenue for the country is based in areas that are 15 to 20 feet below sea level. He also contended that “it does not appear responsible to ask these communities to rebuild their homes in a few months,” and asserted that they could be afforded “breathing room to return” by granting immediate one-year deferments on mortgage payments. Frustration permeated Mayor Nagin’s statement: frustration at supposed federal privacy laws that have prevented him from obtaining FEMA’s list of contact information for evacuees transported to 44 states; at the game played by contractor companies receiving $43 per cubic yard of debris picked up, who subcontract it several times where finally workers in local firms only receive about $7 per cubic yard of work; and the absence of a formula to dictate the allocation of $11.5 billion to the Community Development Block Grant (CDBG) program, which was given to the state of Louisiana rather than the cities of the Gulf Coast area—which may not reach the most devastated areas of New Orleans as a result. “I think politics is going to come into the dissemination of those funds. The money is going to be spread all over the state of Louisiana and my citizens are not going to get their fair share,” he insisted. “I am getting tired of being beat up. I have to deal with my residents and they want answers. They do not want a handout; they want to come home. “We deserve to be supported in our time of need,” he declared, to a standing ovation and applause from many in the audience. According to him, of the 36,000 families that need trailers, only an estimated 2,000 have received them (1,300 for individual sites and 551 for group sites); he had authorized the installation for 8,000 in total and identified 7,000 future sites—leaving a remaining 21,000 in need yet to be supplied; nevertheless, FEMA has not moved ahead on the sites that have already been approved. And the fireworks began. Rep. Waters indicated that FEMA officials in Washington, D.C., led the subcommittee to believe that the problem with providing trailers to the people of New Orleans was that the mayor was not authorizing the installation. So, the hearing was opened for discussion on this point, with all eyes and ears on the local FEMA representative, Mr. Wells. According to him, 500 trailers are manufactured a day—up from 30 per day; the installation process is complicated, but they have never been limited by the manufacturing of trailers. In fact, he boasted, they have 2,500 trailers stored in Louisiana as he spoke. So, when can FEMA deliver on the 21,000 trailers that are needed, asked Rep. Waters. And that was just the tip of the iceberg of inane responses.